But what these occurrences share, and what they’re illustrating, is a profound hatred toward purveyors of journalism. This isn’t news. Violent acts against the media are as old as our nation. Perhaps Americans are just not accustomed to seeing the violence because most of them grew up in the second half of the 20th century, an era largely devoid of the partisan rancor that was once a hallmark of American journalism — and which seems to have returned. James Rivington, an 18th century loyalist printer in New York City, barely escaped being tarred and feathered by the Sons of Liberty, who ransacked his home. Abolitionist and newspaper editor Elijah Lovejoy, who grew up in central Maine, was murdered in Alton, Illinois, in 1837. A pro-slavery mob broke into his jail cell — where he had been placed for his protection — and lynched him. One year earlier, in New York City, The New York Herald’s James Gordon Bennett was savagely beaten by his rival, James Watson Webb. Webb edited New York City’s best-selling newspaper, The Morning Courier and New-York Enquirer, and he’d grown tired of Bennett’s attacks in his popular newspaper column. An 1838 woodcut showing large group of armed men attacking the Alton Observer building. 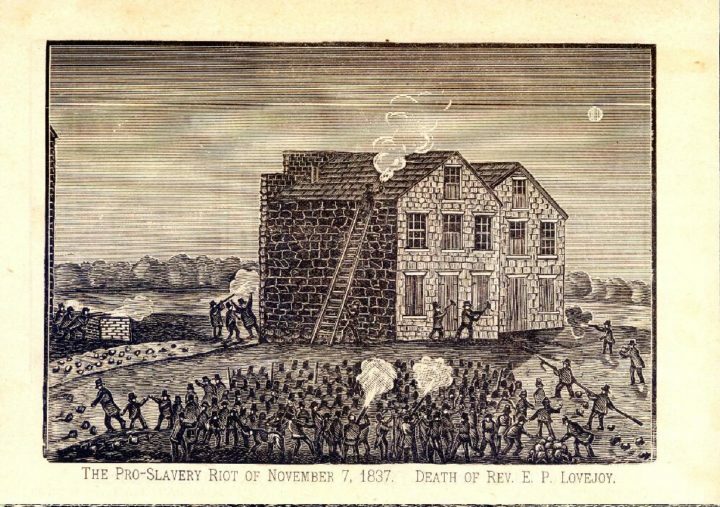 The riot on Nov. 7, 1837, resulted in the death of Rev. Elijah Parish Lovejoy, an abolitionist, newspaper editor and Presbyterian minister. In the early days of the Republic, U.S. newspapers were not only observably partisan, but also subsidized by political parties. Because newspapers around the U.S. often represented specific political parties, news reports would be politically framed and competing outlets — often serving the rival political party — would be demeaned. It’s that kind of centrist journalism that developed in the 20th century — what journalist and political scientist Edward Jay Epstein called “ News From Nowhere” — that many of us grew up on. Regulatory mandates such as the public interest standard and the Fairness Doctrine followed the development of radio and television. They further enshrined a “just-the-facts” sensibility in American journalism. And, in this original network era, opinion was separated from reporting and clearly labeled — whether it was on-air commentaries delivered by Eric Sevareid or on specially designated “editorial” or “opinion” pages in newspapers. Creating audiences in the millions, and then the tens of millions — on television — generated unimagined sums of advertising revenue. Removing opinions from most reporting produced enormous profits for television networks, radio stations and daily newspapers. It became commonplace. Americans grew accustomed to it. Outlets such as Fox News, MSNBC and even some daily newspapers are no longer as careful about monitoring the injection of subjectivity into journalism. But they are not entirely to blame. Today’s audiences feel empowered by their autonomy, because they have an enormous number of available and competing media outlets. They can now watch and consume news that best matches their worldview, rather than a homogenized news product designed to be palatable to the masses. Noting the higher ratings and subscription numbers that accompany this increasing partisanship, news outlets react accordingly. Even more, social media technologies allow audiences to engage with news media like never before, often cultivating a climate of uncivil online discourse. This only intensifies the partisan rancor mirroring 19th century levels. 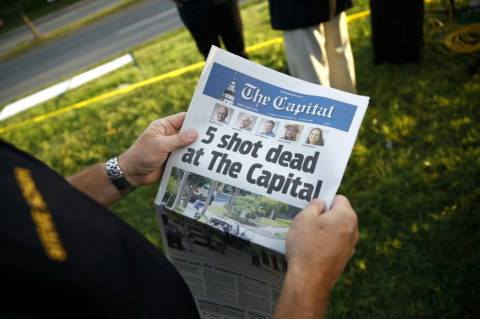 Steve Schuh, county executive of Anne Arundel County, holds a copy of The Capital Gazette near the scene of a shooting at the newspaper's office, Friday, June 29, 2018, in Annapolis, Maryland. Jennifer E. Moore is an assistant professor in the Department of Communication at the University of Minnesota at Duluth and a former University of Maine journalism professor. Michael J. Socolow is an associate professor of communication and journalism at the University of Maine in Orono. 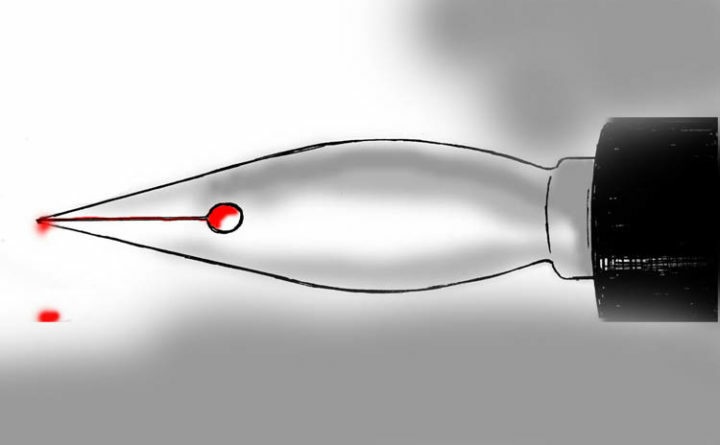 This piece was originally published on TheConversation.com.